The playoffs are quickly approaching, with just about a month before things really get going. In 2014, Bunt had a lot of new fun planned for the entire run, but it was met with a pretty polarizing response. High boost levels and big sets intrigued some, where others were disappointed that some of their valuable cards had been nerfed by a new level of content. I had fun with much of what was offered, but I think there are some adjustments that definitely need to be made. Here are some of my suggestions for the post season blitz. If we are being honest with ourselves, Contests have never panned out this year. Not even in the slightest. I think there were many controllable factors as to why this was the case, but also many uncontrollable. The postseason offers a fresh start in many cases, with new opportunities to close out the year with a bang. I would start by making 3 levels of contests that run the entire post season. There should be a top tier pay to play, a mid tier pay to play, and a free to play low tier. If its possible, decks should be locked daily, but opened back up each morning to allow for changes in new card releases and other cards. No frills, just full deck, unlimited boost, and a high deck limit for number of cards. Winner of the top tier should get the coveted champion’s 1/1 card, with the other tiers winning a large coin payouts and maybe a commemorative card of the World Series MVP. Buy in for each contest should not be more than the cost of a pack. There should also be round by round structured contests that function in a similar capacity. Winners and top finishers receiving Best of Bunt style cards for the players who raked during each leg. Lastly, the daily throwdowns with Go Boosts would be a great feature, all of which have raised stakes with low buy in. Most of the buying should be done on the packs, not on the contests. Remove as many barriers to play the contests as possible. Users who collect by team or player live for their time to collect playoff cards. Each team should get a robust set just like previous years, but boost level should be more considerate of what is in the app already. Creating a playoff pack will be a given, but it would be much better if the pack cost was akin to more of what the standard has been all year. Instead of boosting cards all at once by rarity level, I would MUCH rather see gradual increases as the playoff legs are completed, similar to 2014 Huddle. 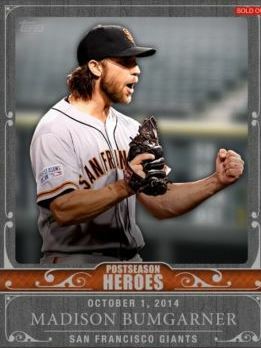 Each playoff participant gets commemorated in a special card, but the whole set should have a standard boost level. Here is what I would do: 2x for Wild Card, 3x for Divisional, 4x for League, and 5x for World Series. Pull rates and rarity levels should correspond to the leg of the playoffs. I would love to see the playoff Parallax sigs come back, as well as a general signature series for the postseason as well. Dual sigs and triple sigs for some of the top guys would be awesome, and all of it should be playoff branded. The use of MLB’s official logos is a must, even better if they are prominently featured. 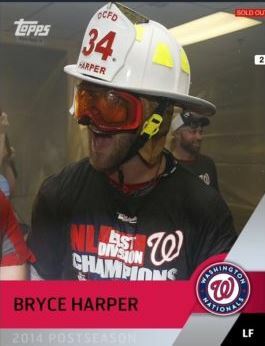 Similarly, the playoff heroes set that acted as a “headlines” type insert last year was a great program, and should be brought back in almost an identical fashion. Collecting sets should procure a large coin prize, and celebrate the best moments as a whole with an award card. History is what makes baseball so interesting in many ways, and working with the tide on this wave is going to be very important. There are top moments from every leg of the post season, and insert sets should be created to celebrate the nostalgia. The most important thing to remember, is that Bunt has become as much about collecting as it has about points, so the teams that arent in the playoffs should not be forgotten. 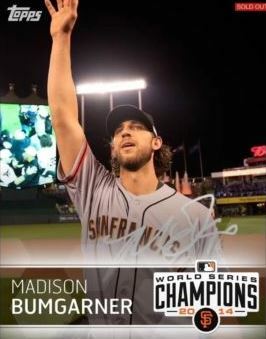 For this part of the year, Bunt should be churning out top cards of the year on a regular basis, as there will be many users who return to the app to finish out the year. With 2015 Huddle launch only weeks away, the focus will shift some. At the same time, many still come back for the final weeks of the season.